Long gone are the "good'old" days of the vinyl records, but it's also true that these records have been experiencing a somewhat nostalgic increase in interest by new (and old) generations. Now, there's even a record player that turns things upside down, and plays a record while keeping it standing still. The LOVE turntable may sound, and look, a bit crazy. 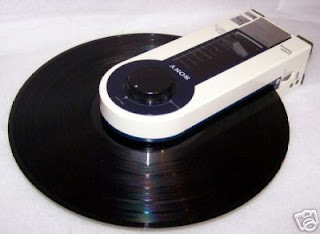 Instead of spinning the record, it spins itself on top of the record, and you can control it remotely using an app. If you've been around long enough, it may even make you think of those old portable record players, though those still spun the record and kept the needle (nearly) motionless. I admit the LOVE is sort of funny, but I wonder if the true vinyl enthusiasts will appreciate having such a high mass pressing down on their records; not to mention that it uses bluetooth/WiFi to stream the sound, which kind of defeats the purpose of those wanting to enjoy the analog sound of the pressed records.